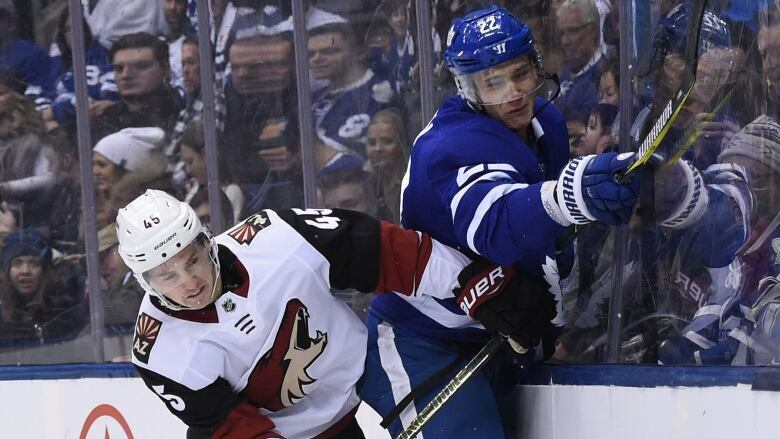 Vinnie Hinostroza scored the winner in the third period as the Arizona Coyotes defeated the slumping Toronto Maple Leafs 4-2 on Sunday night. Mike Babcock felt his team didn't have a lot of luck. John Tavares thought there were a lot of things to build on. "We had the puck a lot," Babcock said. "I liked a lot of the things we did." Toronto is just 13-11-1 at home — including 1-6-0 over its last seven — following a fourth straight regulation loss at Scotiabank Arena. "Knowing what you can do and going out and doing it is definitely a different thing," said the rookie defenceman. After the Leafs tied the game at 3:12 of the third when Tavares ripped his 30th goal of the season to awaken a slumbering Scotiabank Arena, the Coyotes came right back on Hinostroza's fifth — a bank shot off down-and-out Andersen at 6:44. Toronto defenceman Morgan Rielly hit the post at the other end moments later — one of three occasions the Leafs found iron. Playing their third game in four nights following Friday's 3-1 road loss Florida, the Leafs pushed for an equalizer, but Crouse iced it into an empty net with his eighth. Toronto's power play — just 6 for 51 over its last 20 games coming in — went to work late in the second, but the NHL's No. 1 penalty-killing unit held firm. Connor Brown was promoted to Nylander's spot in Toronto's top-6 forward group to start the evening alongside Johnsson and Auston Matthews — another star struggling to find his offensive rhythm with only one goal in his last 13 outings. "We're going through some adversity," Matthews said. "Hopefully in the long run this is something good for us and we learn from it."